Claymont – The Delaware State Police Collision Reconstruction Unit is continuing their investigation into a fatal motor vehicle crash involving a pedestrian that occurred at approximately 4:26 p.m., Sunday, July 1, 2018 on I-95 northbound in the area of Harvey Road, Claymont, according to Public Information Officer, Master Corporal Michael Austin. 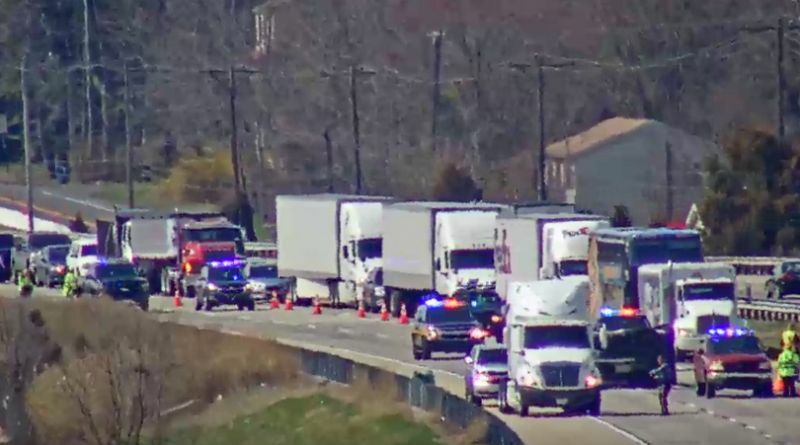 Austin said at approximately 4:15 p.m., this same date, Brian L. Evans, 29, of Claymont, was a driver involved in a motor vehicle collision that took place in the vicinity of Glenrock Drive and Osage Road, in the Radnor Green development. 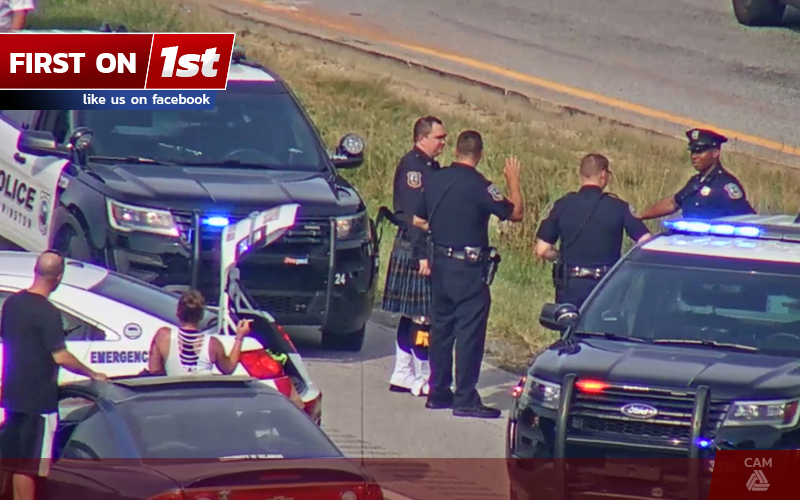 After the collision, Evans walked away from the scene and proceeded to cross over a concrete barrier on the Harvey Road overpass and then jumped down onto the I-95 northbound shoulder. Based on witness accounts Evans then stumbled into the I-95 northbound right lane of travel at which time he was struck by a 2017 Chevrolet Silverado, operated by a 57-year-old Ocala, Florida woman. After being struck Evans was thrown to the roadway coming to rest in the I-95 northbound, right lane. The Chevrolet came to a controlled stop and remained at the scene. Evans was transported to the Christiana Hospital where he succumbed to his injuries. Impairment on Evans behalf is unknown at this time. The operator or the Chevrolet and her passenger were not injured as a result of the collision. Neither speed nor impairment is being considered as factors on the operator’s behalf. I-95 northbound at Harvey Road was closed for approximately 3 hours as the scene was investigated and cleared. Claymont – Yesterday afternoon a series of events unfolded that would end with a man in his 20’s gravely injured and a Wilmington Police Officer in the trauma center. 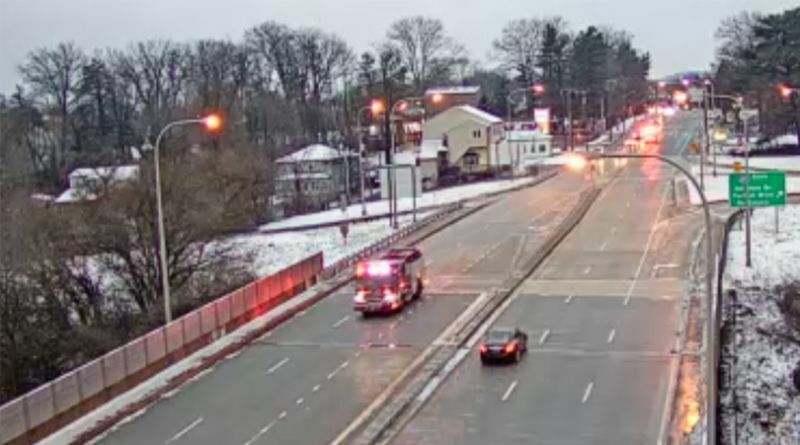 Just after 4:30 on Sunday, authorities in the Claymont-area began receiving word that a person had fallen from the Harvey Road / I-95 NB overpass and that he had been struck by a vehicle. As rescue crews from the Claymont Fire Company, New Castle County Paramedics, Delaware State Police and New Castle County Police responded to that scene, additional reports began coming across emergency radios. 911 operators first alerted responders to a head-on collision at the intersection of Osage Road and Glenrock Drive. 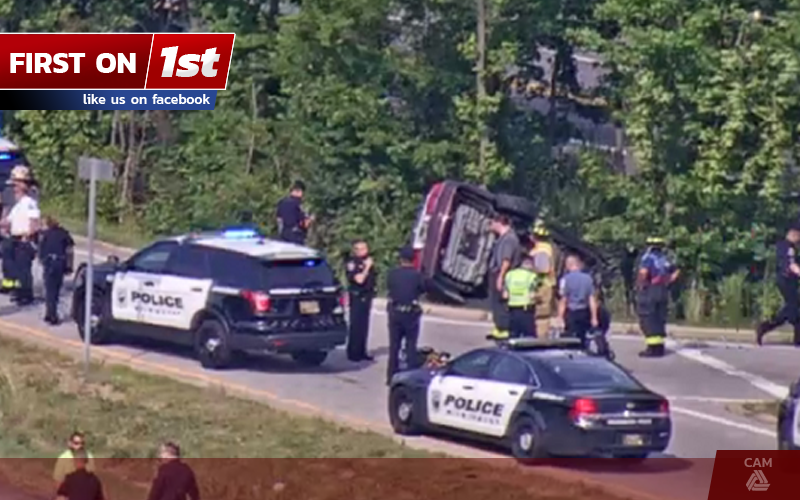 Just minutes later they reported that a Wilmington Police Officer was involved in rollover crash on I-95 NB in the area of Marsh Road. The first units dispatched, arrived at the Harvey Road / I-95 NB scene to find the badly injured man in the roadway, near the Harvey Road overpass. Due to the seriousness of his injuries, authorities ordered I-95 NB shut down. Crews did what they could to treat the patient before transporting him to the hospital with grave injuries. As medics worked to treat that patient additional, additional crews began to arrive at the Osage Road and Drive Glenrock scene, just blocks from the Harvey Road overpass. Those crews reportedly found one driver suffering from head injuries and began to treat her. It’s unclear if she was transported to the hospital. The driver of the other vehicle involved in that crash reportedly fled the scene on foot, according to witnesses. 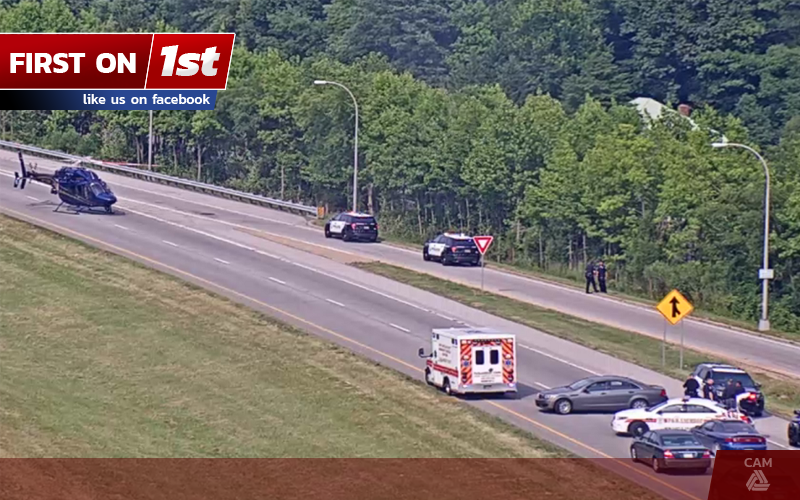 Just down the road, at the I-95 NB / Marsh Road crash, crews found a Wilmington Police Officer in a vehicle that had rolled off the roadway an into the treeline. They quickly worked to free the officer from his vehicle. 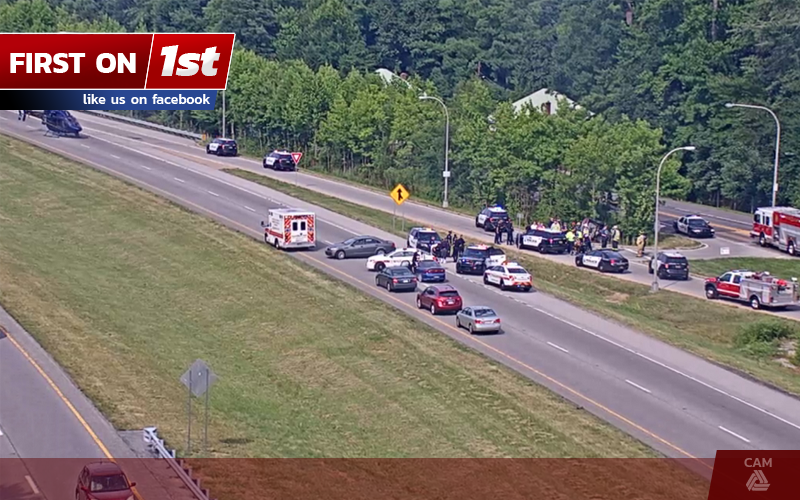 After several minutes the officer was removed from the vehicle and transported to the trauma center at Christiana Hospital via Trooper 4 (Delaware State Police Aviation). Early reports from the scene indicate that the officer may have been responding to one of the other two incidents when he rolled over. Within minutes of our first report, witnesses and bystanders began to share what they were seeing on social media. 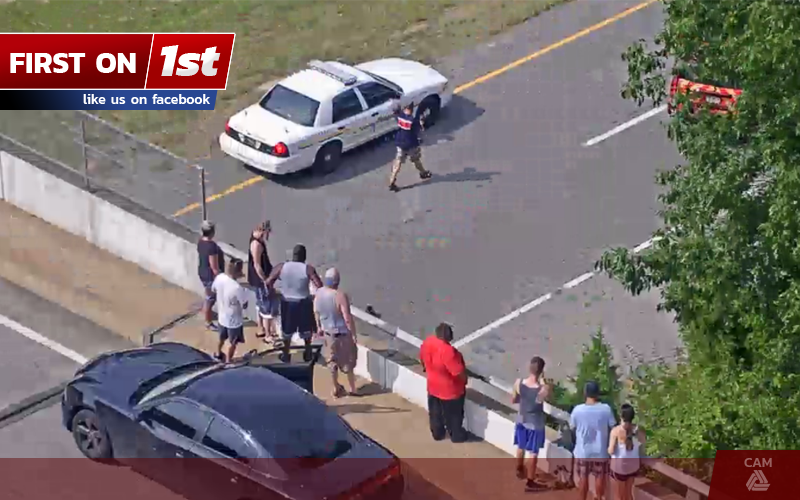 Witnesses at the scene, using Facebook, began to report that the man that had fallen from the bridge was the driver that had reportedly fled the scene of the hit-and-run at Osage Road and Drive Glenrock. That has not been confirmed. Medics on scene reported that the patient had jumped onto the highway from the overpass and had fallen 30 to 40 foot. 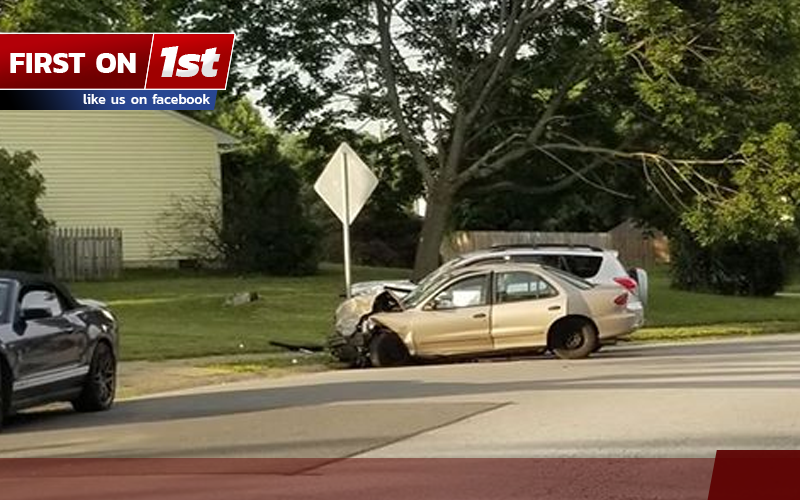 Another witness driving by the scene posted a comment on our Facebook page describing the incident. “It was terrible I saw him fall from the bridge. He got up looking disoriented and walked right into traffic and the truck behind me hit him at least 60 mph. He was thrown 10ft”, said the poster. I-95 NB was shut down at Harvey Road and at Marsh Road while crews worked to treat the patients and investigate the incidents. We’re expecting an update from several police agencies in regards to these incidents. This story will be updated as more information becomes available. 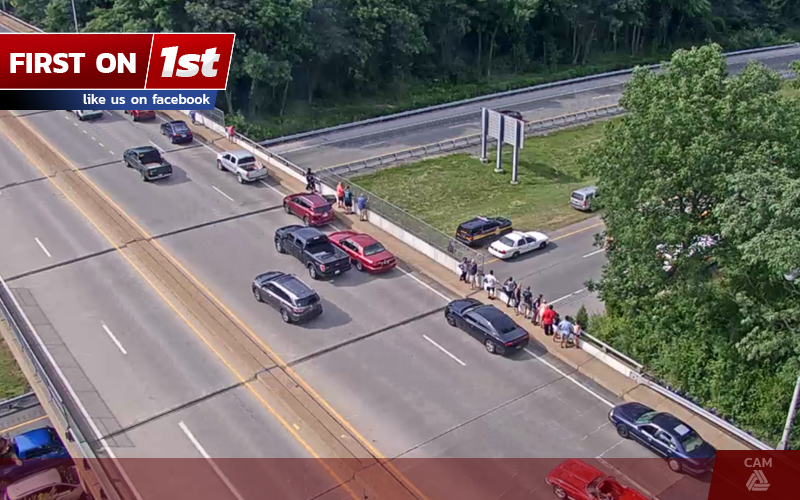 Claymont – Rescue crews from the Claymont Fire Company, along with New Castle County Police, Delaware State Police and Trooper 4 are responding to I-95 NB at Glenrock Drive. Initial reports indicate that a person has fallen from the overpass and has been struck by a passing vehicle. Authorities have closed I-95 NB at Harvey Road. Use alternate routes. 4:46 pm Update: The condition of the patient is unknown at this time. 4:46 pm Update: Trooper 4 has been diverted to an officer involved crash at I-95 and Marsh Road. 4:50 pm Medics are reporting that a male fell from the overpass, an approximately 30 to 40 foot fall before he was struck by a vehicle. 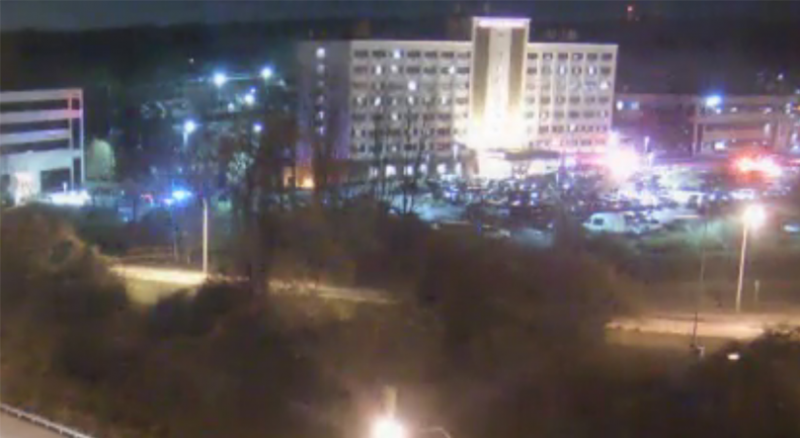 The patient en route to the Christiana Hospital Trauma Center.